I had to replace the gear and sprocket assembly after the sprocket got sheared off, likely due to too much play in the chain. The replacement of this part is relatively straight forward and the instructions that come with the part (part number 41C4220A) are clear. This can be replaced in about an hour. 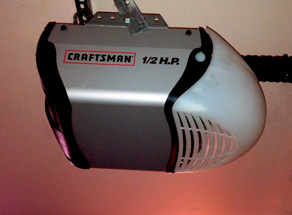 A problem came along after the assembly was complete and I tested the garage door opener. The trolly was parked where the door would normally remain closed. When I pushed the button, the door began to open but it didn't stop and hit the stop bolt causing a lot of stress on the chain. Eventually I got it to reverse back down but it didn't stop when it hit the ground causing the rail to flex and almost buckle. Despite endlessly turning the travel and force adjustment screws, I wasn't able to correct the problem. After examining the unit it occurred to me that when I reassembled the unit, something called the limit switch assembly (part number 41D3452) was misaligned. 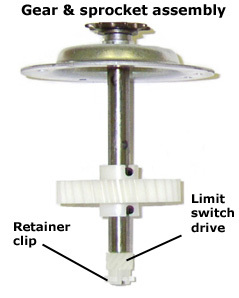 The unit has three white rods representing the drive gear screw and two adjusting screws. 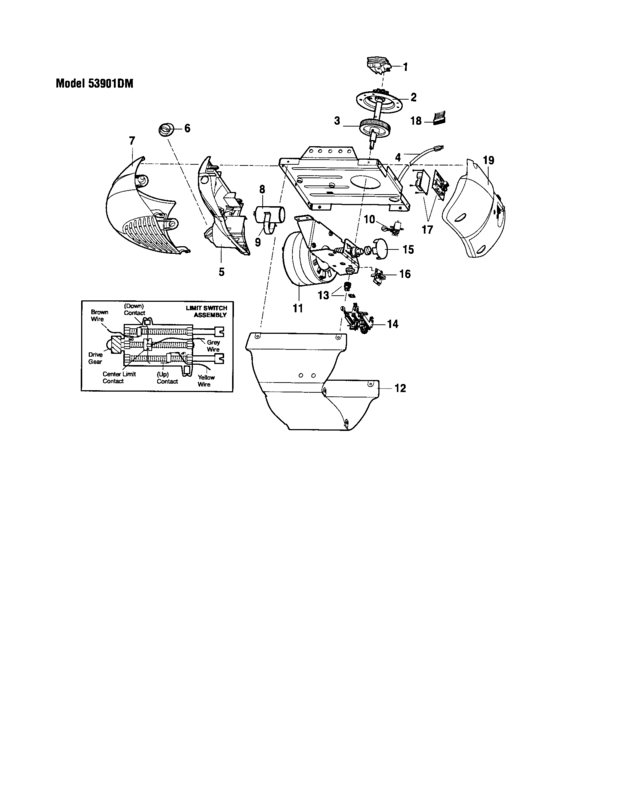 I've diagrammed it below looking from the top down as Figure B. Alternatively, see Sears Parts Direct for a complete blow apart diagram of a typical Craftsman garage door opener. Ensure that chain isn't torqued against the bolt as this could be very dangerous to work on. Release the garage door from the trolley using the emergency release cord. Note where the trolley arm is parked. Is it in the down position, up position or somewhere in the middle? In Figure A, at the bottom of the gear & sprocket assembly shaft, there is a small white plastic piece called the Limit switch drive. 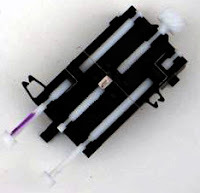 It is attached with a plastic retainer clip, either pull this out with a set of needle nose pliers. Slide the drive off. You can optionally unclip the limit switch assembly (Figure B) and adjust it or adjust it in place. I did the latter. If your trolley is the completely down position, turn the drive gear (1) so that the centre limit contact (2) is closer to the drive gear or (the green line in Fig. B). Turn it to the middle position (yellow line in Fig. B) if the trolley is in the middle of the rail and if it is at the top, put it near the travel adjusting screw heads (red line in Fig B). The key is that when the garage door opens or closes, the centre limit contact moves up and down the centre white plastic drive gear screw. When it comes into contact with the metal down contact (3) it stops and the same goes with the up metal contact (4). Assuming that trolley is in the middle of the rail, place the up and down contacts (3 & 4 in Fig B) so that they are about an inch away from the centre contact (sitting on the green and red lines in Fig B). If the trolley is all the way at the bottom, the down contact (3) should be touching the centre contact (2) over the green line and the upper contact (4) should be at the red line. Lastly if the trolley is in the all the way up position, have the upper contact (4) touching the centre contact (2) over the red line and the down contact a few inches away near the green line. Reassemble Limit switch drive and retainer clip and ensure that the front and rear panels aren't in the way. I had them partially screwed back in. Plug the garage door opener back in and test. The garage door likely won't go all the way up or down but this is where you use the travel adjusting screws to fine tune. So that's it in a nut shell. Keep making small adjustments to both the travel and force adjusters in accordance with the manual or the instructions that came with any parts you ordered. Good luck and be careful! "According to the US Consumer Product Safety Commission, 20,000 people each year have been treated in hospital emergency rooms for injuries related to garage doors. The most common injury is fingers getting caught or crushed. Injuries relating to the failure of extension or torsion springs send approximately 1,000 people to hospital emergency rooms every year in the U.S. I just replaced my limit switch. Now its stuck in the up position and wont go back down. I just get a hum when I press the button...help! Limit switch must be adjusted according to the instructions listed above. It means that the door thinks it's already down so it won't move down. Some one must adjust the down contact so it doesn't think it's already down. Keep in mind I am NOT a professional and adjustments to this device can be dangerous due to the amount of force it generates. If you don't know what you are doing hire a professional!! All of the above is correct, parts cost about $20 for the gear which started the repair. But when the limit assembly got out of adjustment it wanted to travel too far one way and not far enough the other. It also hit the stop bolt and started humming and wouldnt move. I disconnected the chain move it back readjusted the stops and it works fine now thanks to posts like this one. Used your post, and fixed my problem within minutes. Wasn't too difficult, but without your breakdown of the limit switch assembly it would have taken longer. Just want to say thanks for taking the time to put this online. Great! Glad it helped out. Thanks so much! Fiddled with the levels for two hours (my ignorance + overheating) and got nowhere. Took a break, found this page and read through your explanation and was finished in minutes. Amazing how much faster a project gets done when you understand what's happening rather than just turning screws and trying to figure it out. Thanks!!! Let me add to the chorus of thanks for this information, Frank. I spent the better part of a day trying to figure out why my in-laws' garage door opener suddenly began acting so erratically -- stopping part way in both directions. Understanding how a limit switch works made it possible to diagnose and fix the problem within minutes. Bravo!